The spark plugs and coil packs in a DB9 are snugly tucked away under a Spark Plug Cover. If you’ve had the cover off to perhaps change your Coil Packs and Spark Plugs (as I have been doing as part of dealing with a Lumpy Idle issue), you’ll inevitably need to reinstall the cover. Doing this isn’t hard, but there are a few tips I will share below to get it done just right. 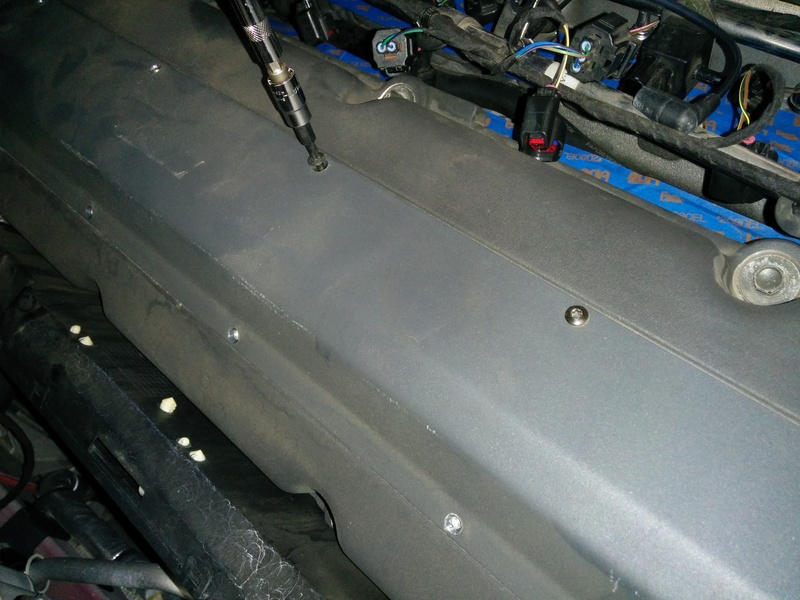 I’ve done a lot of work to get to this point, and you can check it out by reviewing this post on how we got the Spark Plug covers off. While I have the covers and bolts off, I did a couple of things. I cleaned the covers to remove any grime or dust. I want my engine looking as awesome as the rest of the car. I used a little 409 cleaner and a clean rag to wipe them down. Easy. I lubricated each of the 20 bolts with a dab of clean engine oil on the first few threads, then spread it around for good coverage. This just make them thread in a little easier than if they were dry. The Official Aston Martin Workshop Manual section on changing the spark plugs succinctly covers this in step 4 “Install the Spark Plug Cover”. I’ll be a wee bit more verbose. The whole process will take about 5 minutes per side. Tip: Anytime you have a large plate with lots of bolts, install each bolt loosely by hand first so the cover is still loose to wiggle about a bit. This will help you get them all started and lined up before you start tightening them. Tip: Start the bolts by hand and make sure they are going in smoothly. The bolts are steel and the valve cover is aluminum. If you cross thread the bolts you are wrecking the expensive valve cover not the inexpensive bolts. Just be careful and if it doesn’t go smoothly, stop and investigate why. Use the Nut Driver and snug up each of the bolts, but leave the final tightening for the Torque wrench. The Official Workshop Manual lists 2.5 – 3.5 Nm (2 -3 ft lbs). I set my torque wrench to 3 Nm. Tighten each bolt with one smooth pull until the wrench clicks. These bolts are pretty small, so use your senses too, don’t snap them off if it feels like you are over tightening them. That’s it. Cover installed and now you can get onto something more exciting!